This year, like every year, my kids have a school supply list that includes way more items than they can possibly use. I know that part of the 32 glue sticks on their school supply lists will go to other children in their class because their parents did not send any glue sticks. 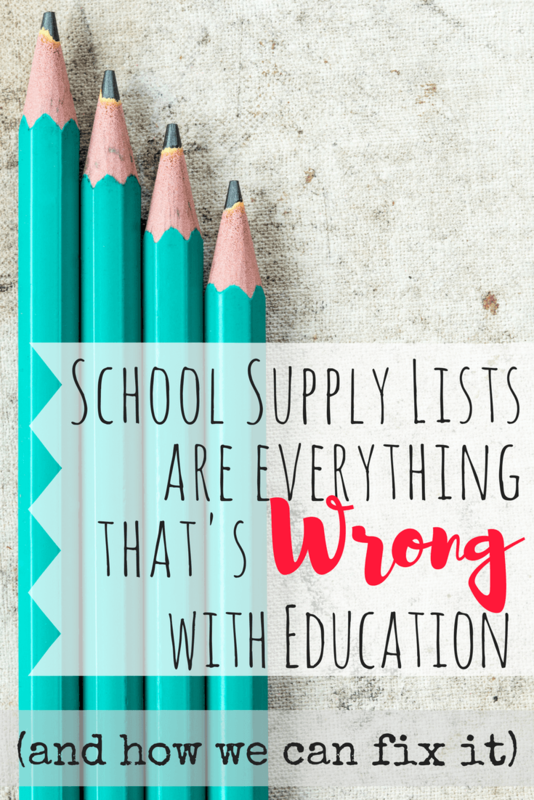 And while I am all for supporting education (especially my own children’s), I don’t like that the supply list demands that I provide enough for other kids. Now, before you assume that I am selfish and unkind, with a heart two sizes too small, hear me out. I know that most of the time when students don’t have what they need to be successful in school, teachers end up paying for it themselves. Every year that I taught I filled in for holes in school supply lists. Because generally speaking, teachers are kind people. They voluntarily chose a profession that they knew they’d never make much money doing. They went to school and earned at least a bachelor’s degree to spend their days taking care of other people’s children. It is a hard profession. 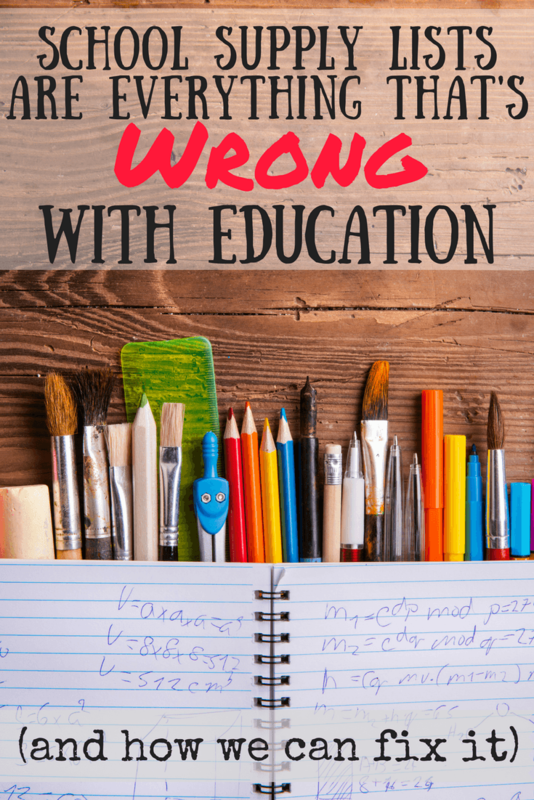 I taught English in underfunded, Title 1 schools for six years, and then, I quit. Teachers that can, have my utmost respect. So, I’m certainly not advocating that teachers be responsible for providing all the necessary supplies. What I’d prefer instead, is for the mandatory supply list to include exactly what my child needs and only what my child needs. If my child will actually use 2 glue sticks per month, then ask for 20 glue sticks. Then, at the bottom of the list, put a note explaining that some kids will not bring school supplies and ask me to send extra. Give me the opportunity to be generous. Let me use school supply shopping as a chance to teach my children about generosity. Don’t force me to take part in some sort of socialist redistribution of supplies. The way that school supply lists are set up now make parents feel tricked. We all know that we are providing for the less fortunate children in our child’s class. And I’m totally on board with helping others. I enjoy it. Our family seeks frequent opportunities to serve others. I want my kids to be cheerful givers. But to be a cheerful giver, you have to be given the opportunity to give. See that part betwixt the commas? How do I teach about generosity when the supply list is worded to sound like all the things I buy will be used for my child? Explaining to a five year old that his list says he needs 32 sticks of glue, but they’re not actually all for him, but we are going to buy all 32 sticks, but he is going to give them all to the teacher and all the kids will use them not just him, but we will be glad about it because we are choosing to send extra even though we are only sending the 32 that the list says each student needs. And no. Your teacher isn’t a liar or a trickster for saying that you need 32 sticks of glue when really you don’t need all 32 but some kids don’t bring any glue so you bring extra and whoever needs the glue uses the glue. Ugh. It’s exhausting being a parent. I understand that as a teacher it would be scary to trust people to be generous. What if you put out there that each kid only needs 20 glue sticks and no one sends any extra?? Have some faith in parents. This past year, my first grader told me how sad she was that her friend could not go on a field trip because she hadn’t paid her money yet. When I asked how she knew that the money hadn’t been paid, she told me that the teacher had written the names on the board of the kids who hadn’t paid and had told the whole class that those kids couldn’t go. Even though our socioeconomic status is solidly locked in the lower middle class, we are still able to help those less fortunate. And I’m sure that if the teacher had sent home a note or sent out an email explaining that some students didn’t have the FIFTY CENTS needed to go on the class field trip, she would have gotten more than enough money to cover the $1.50 needed. So, my suggestion is for teachers to be honest with parents. Tell them exactly what their child needs up front. Then, tell them that there are other children in the class who need supplies or field trip money or a snack everyday for snack time or whatever. Trust that the majority of people are good and kind and want to help. Give them opportunities to help. Allow them to model the sort of behavior we hope to see in their children. Yes, this will add one more thing to the already ridiculously long list of things that teachers have to do. Communicating with parents is time consuming, but unlike uploading lesson plans to a state database or sitting through two weeks of inservice, engaging parents actually has a positive impact on education. There are a couple of easy ways this can be accomplished. Send home a well worded note about how there are always children that don’t have enough through out the year. Then, give parents the opportunity to be added to a group email notifying them of the needs as they arise. Sign up for Remind 101 (an app that lets you text groups of parents without giving out your actual cell number) and have a station at Meet the Teacher with information about how you’ll use it this year to not only communicate upcoming events, but also the needs of the less fortunate in your class. All teachers have had bad experiences with parents. But those bad experiences can be the exception and not the rule. Make your first interaction a positive one. Give parents a chance to help not only their own child, but other children in a tangible way. Let the parents meet needs with love and model that behavior for their own children. It’s time for teachers and parents to get back on the same side again. The best way to do this is to start the year off with honesty. Please don’t trick me into buying extra supplies. Give me the opportunity to be generous and helpful and I will gladly bring 60 glue sticks. They’re really cheap on Amazon right now. 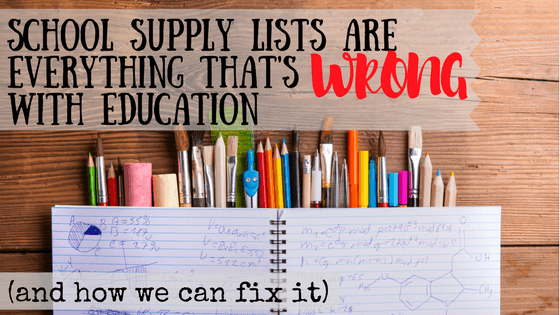 What do you think about school supply lists? Unfortunately, there are many districts who do exactly that. We are blessed to have local organizations and churches that donate supplies to our less fortunate students on an annual basis. We are blessed enough that any extras are returned to the students those brought them at the end of the year. Since each item is labeled with that student’s name when they are sent, that makes it very easy to do. We are also blessed by many generous parents that donate their leftovers to us at the end of each school year. For those parents that do so, we thank you wholeheartedly for you kindness. We also have a campus fund that we use to pay for any students who do not have the funds to cover things like field trips and other educational activities. time out to share these things with the administrators so that those behaviors are addressed. Sadly, it is usually a topic of public conversation instead. It breaks my heart to think that these situations would ever occur, but we know they do in all schools everywhere. Parents, if you experience these types of situations in your schools, do us all a favor and let your principals know. I know they would be very appreciative of your honesty and would be able to address these situations since they cannot address issues that are not made known to them. As educators, we love all of our children and our teachers. Through sharing and caring comes learning. God bless you all!